On greeting Czech pilgrims accompanied by the Cardinal Archbishop of Prague Dominik Duka, at the end of the General Audience in St. Peter’s Square on May 31, 2017, Pope Francis encouraged them to have recourse “with confidence to the Virgin’s intercession. The group was in Rome for the 75th anniversary of the massacre of Lidice, a village eliminated with its inhabitants by the Nazis in 1942. 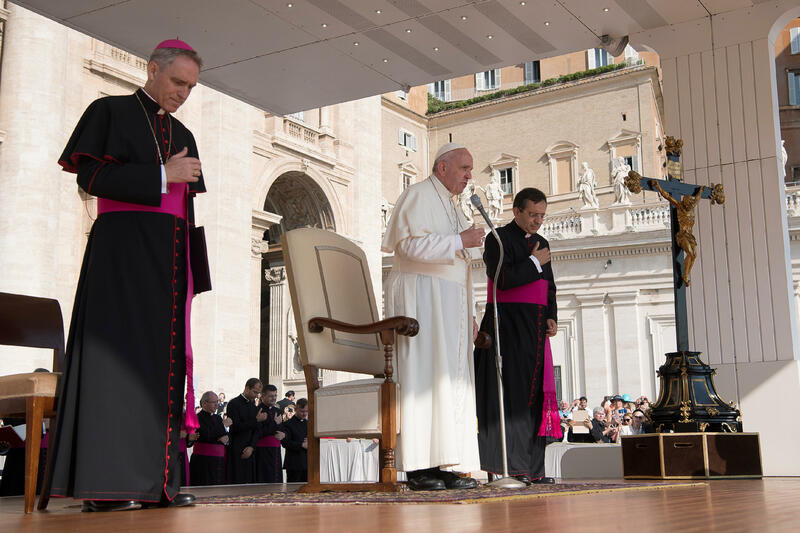 “I greet warmly the faithful of the Czech Republic, in particular the participants in the national pilgrimage led by Cardinal Dominik Duka, Archbishop of Prague, on the occasion of the 75th anniversary of the massacre of Lidice by the Nazi regime,” said the Pope. The 150 pilgrims were accompanied by the Vice-Minister of Foreign Affairs Vaclav Kolaja. “Dear friends, have recourse with confidence to the intercession of the Holy Virgin, whom you venerate in the representation of the Virgin of Lidice. May she help you to be courageous witnesses of Christ’s Resurrection, also in moments of difficulty or trial. My blessing to you all!” he continued. The village of Lidice, in the region of Central Bohemia, was entirely destroyed by the Nazis during World War II. Its inhabitants — 184 men older than 16 and some women –, were shot by SS soldiers on June 10, 1942. Of the 105 children of the village, only 17 survived. Some of them who had the physical characteristics corresponding to the “Aryan race” were placed in German families to be re-educated. The others were sent to extermination camps. According to L’Osservatore Romano, the Pope met two women who survived the camps. After the massacre and deportations, the Nazis set the village on fire to do away with any trace of its existence. A Memorial was erected on the site of the old village.